A new edition - revised and updated with over 100 pages of new material - of the groundbreaking book that brings the principles of organizational learning to today s schools and classrooms. 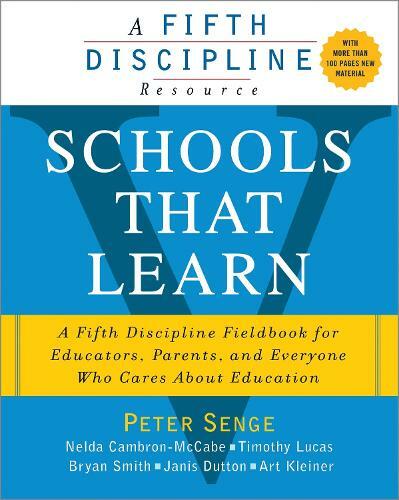 A unique collaboration between the celebrated management thinker and Fifth Discipline author Peter Senge , and a team of renowned educators and organizational change leaders, the revised edition of Schools The Learn addresses the new and unique pressures on our educational system that have emerged since the book's initial publication in 2000. In a fast-changing world where school populations are increasingly diverse, children live in ever-more-complex social and media environments, standardized tests are applied as overly simplistic "quick fixes," and advances in science and technology continue to accelerate, the pressures on our educational system are inescapable. Schools That Learn offers a much-needed way to open dialogue about these problems and provides pragmatic opportunities to transform school systems into learning organizations. Schools That Learn is the essential guide for anyone who cares about the future of education and keeping our nation s schools competitive in our fast-changing world.